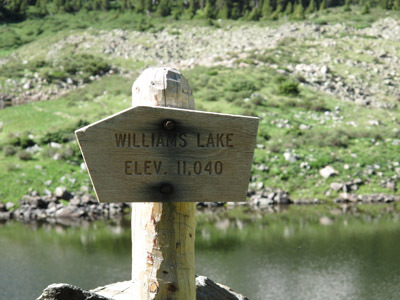 The Williams Lake Trail is arguably the most popular trail in the Taos Ski Valley. Although it officially starts at the ski village, most people access it from the parking area up the road to the south and east of the village. This parking area is at N36 34.7566 W105 26.4008 and 10,191 feet. 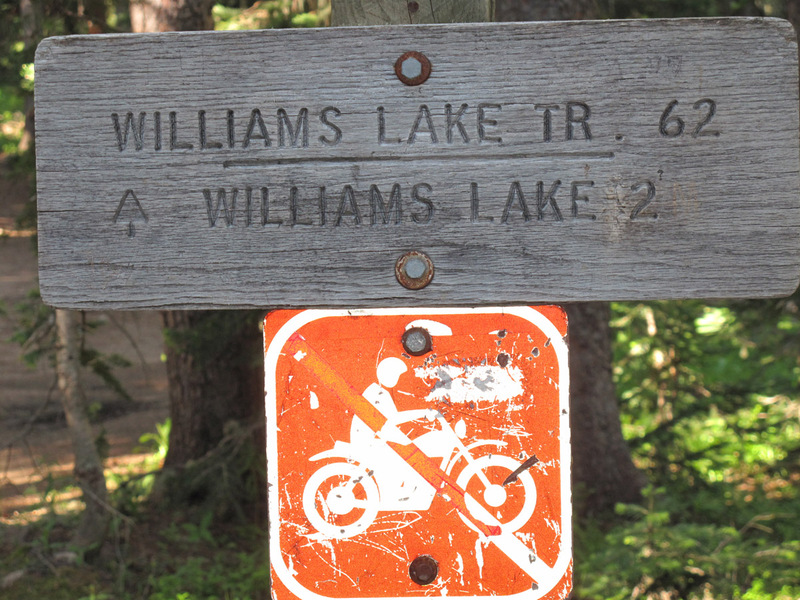 The Forest Service claims that it is 2 miles to the lake from here -- it is actually 1.91 miles. The trail reaches its summit at 11,142 feet about a quarter-mile from the lake. While the trail is regarded as easier than most in the ski valley area, it does climb more than 700 feet per mile. The reason it seems simpler is that although the steep stretches are very steep, the trail is short and there are several nearly level stretches. The Forest Service write-up is here. It provides driving instructions to get to the trail. Haven't finished the writeup, but here are some pictures from the trail! 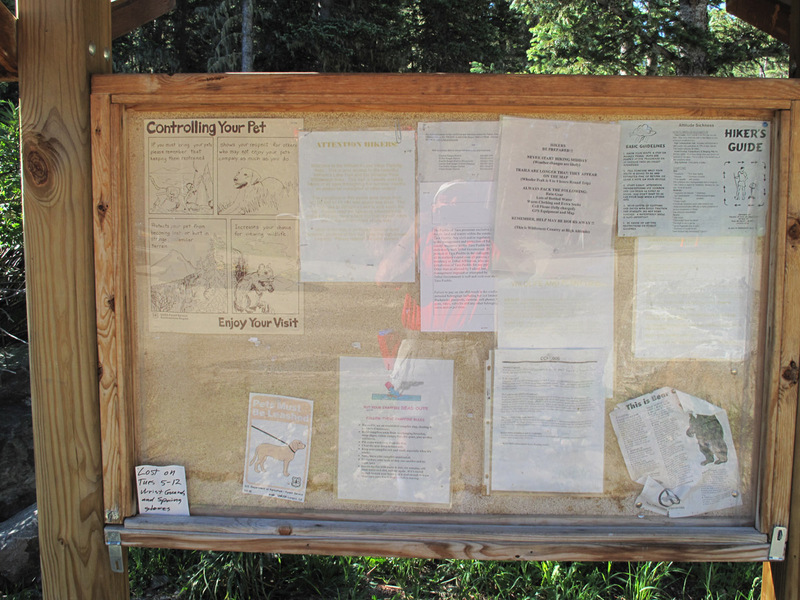 This is the message board at the Williams Lake parking area. There are also toilet facilities at the parking area and a picnicking area but no water. 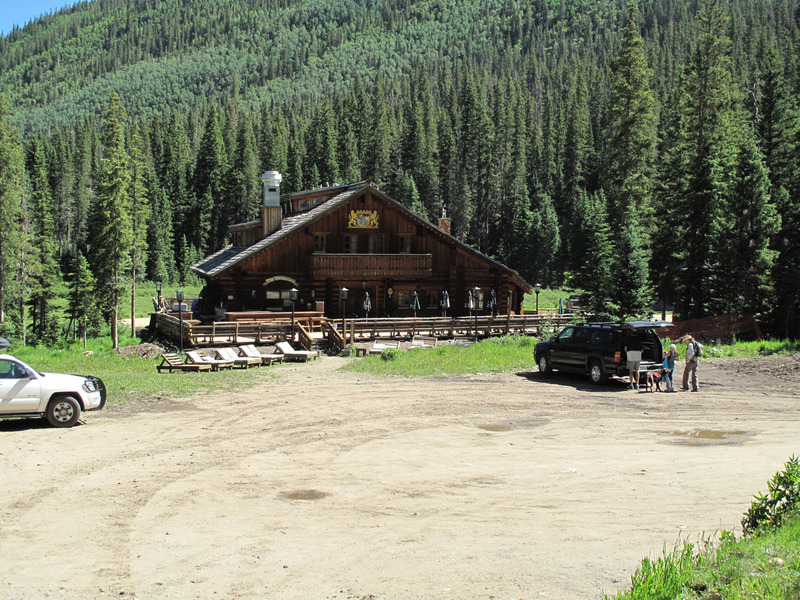 This is the Bavarian Inn which you will pass on your left as you head up the trail. It opens at 11:30 am during the summer and is an excellent place to stop for a beer and brats on your way back to your car. This is the view you'll have of the lake as you enter the bowl. The Williams Lake sign. You've made it! If you walk northeast from the sign up the trail into the woods, you'll have this view of the lake. This trail gets quite steep and eventually intersects the Wheeler Peak trail after a nasty climb through scree. 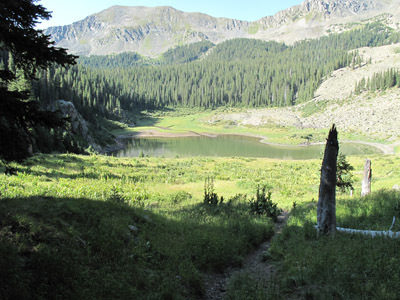 As you walk down the slope towards the lake, a small trail appears on the right (N36 33.4750 W105 25.8285). 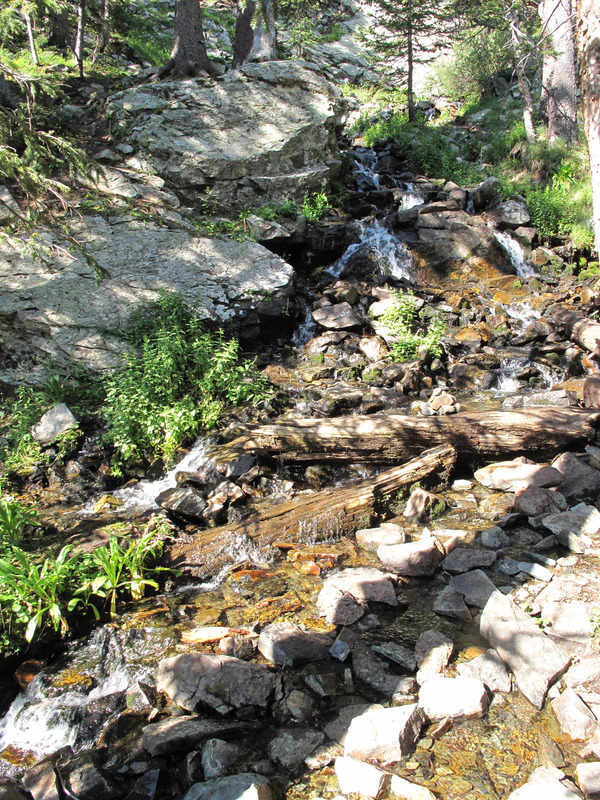 If you follow this trail for about a third of a mile you'll reach a beautiful little waterfall. 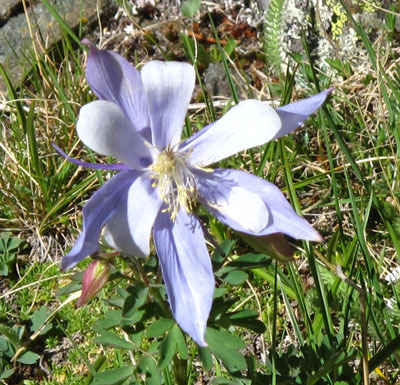 This is a Columbine blossom growing in the rocks on the trail to the waterfall. This is the waterfall. It is also a nice shady area to have a bit to eat and rest before heading back to the parking area. If you wish to make comments or suggestions, click here. 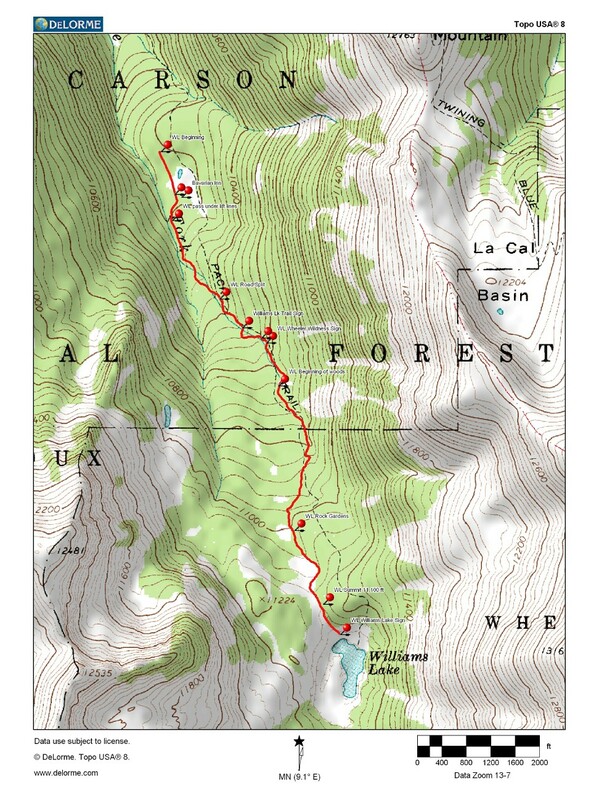 Information on this site was derived from actual hikes as well as DeLorme Topo USA® 8.0 software and DeLorme PN-20 and PN-40 handheld GPS units. In addition, some tracks were recorded using a QSTARZ BT-1300S keyfob GPS receiver/logger. 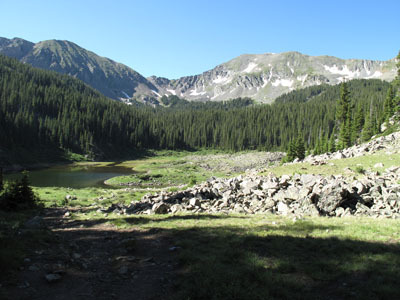 This site describes and maps information on hiking trails near Taos, New Mexico. The author accepts no responsibility or liability for the accuracy of this information. Consult the United States Forest Service or the Bureau of Land Management (BLM) information to confirm what is published here. The entire site including but not limited to pictures, tracks, waypoints, and text is ©2009-2010 Michael J. Mellinger and may not be used, except for personal non-commercial use, without prior written consent.